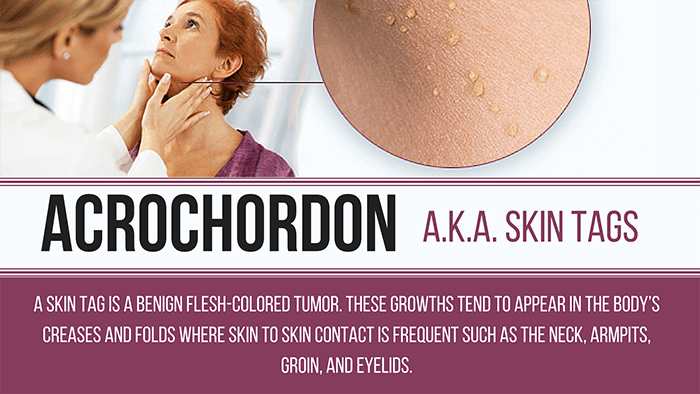 A skin tag, also known as an acrochordon, is a benign flesh-colored tumor. These growths tend to appear in the body’s creases and folds where skin to skin contact is frequent such as the neck, armpits, groin, and eyelids. They are completely harmless, but can itch or hurt when repeatedly irritated by clothing, jewelry, or shaving. There is no well-established cause for skin tags, though their frequency increases in overweight individuals and in pregnancy. Skin tags do not require treatment unless they become irritated or if a person considers them cosmetically undesirable. Fortunately, removal of skin tags is simple for they can easily be excised, cauterized, or frozen off at Contour Dermatology. Do not attempt to remove skin tags at home.